The other night, Chris asked me how long it’s been since I’d posted. July 2014. Woah. But on occasion, I miss this place. I know I say that every time I disappear for a while, but it’s true. Plus, sometimes I make something that I just need to share. And tonight, that happened. I still cook the same way. A lot of other things have changed (more on that in a moment), but I still clip recipes from my favorite magazines, and sometimes they sit around for a while, sometimes they get cooked immediately. Nduja (en-doo-yah), a spicy, spreadable pork sausage, is an ingredient I’ve wanted to cook with for a long time. 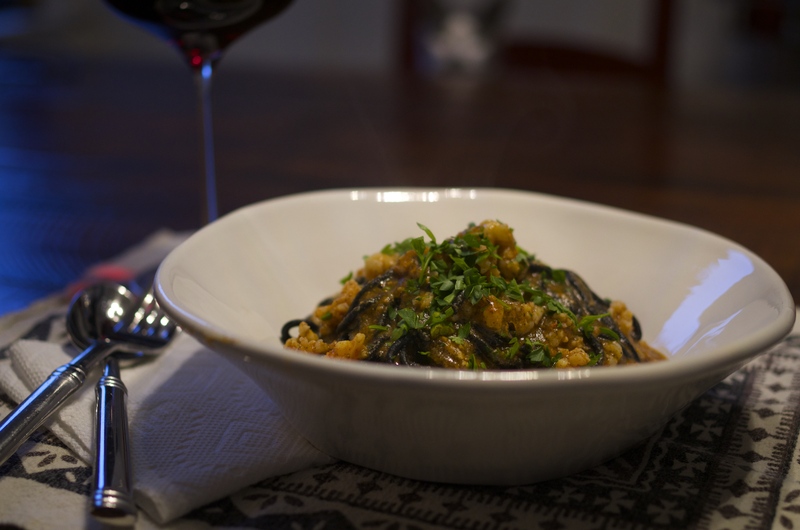 I found a recipe in a recent Bon Appetit magazine that I couldn’t resist – a pasta sauce made with nduja, with small pieces of shrimp nestled within, and squid ink pasta running throughout. 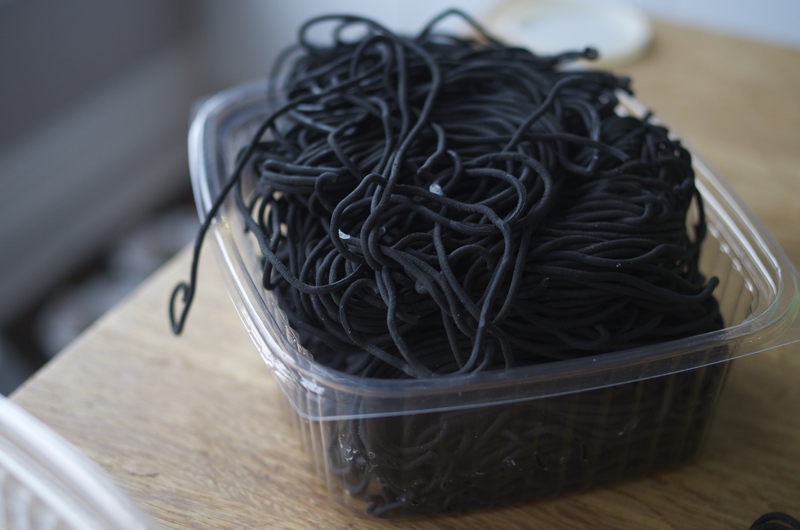 I’m sure you could buy squid ink (actually, I know you can) and make your own fresh pasta injected with it, but I prefer to just pay someone to do this part. I’m all about a cooking project, but not on a weeknight, and this is a weeknight recipe, no doubt. If you’re in San Francisco, Local Mission Market is the place to go. The end result is really magnificent. Saucy, spicy amazingness bathing fresh, black pasta with a nubbin of shrimp in every single bite. It reminds me just a tad of paella – and I’m not sure I can explain why, so I’ll just let you decide, if you decide, of course, to whip this up. Did you see a little furry face in the background above? Go look again – you were probably focused on the pasta. Not judging. But I’ll back up for a minute. A while ago, I mentioned that we were house-hunting. It takes a long time in San Francisco. Well, 7 months and 7 offers later, it finally happened! We moved late in August last year, and said Adios! to that little ol’ Mission apartment. 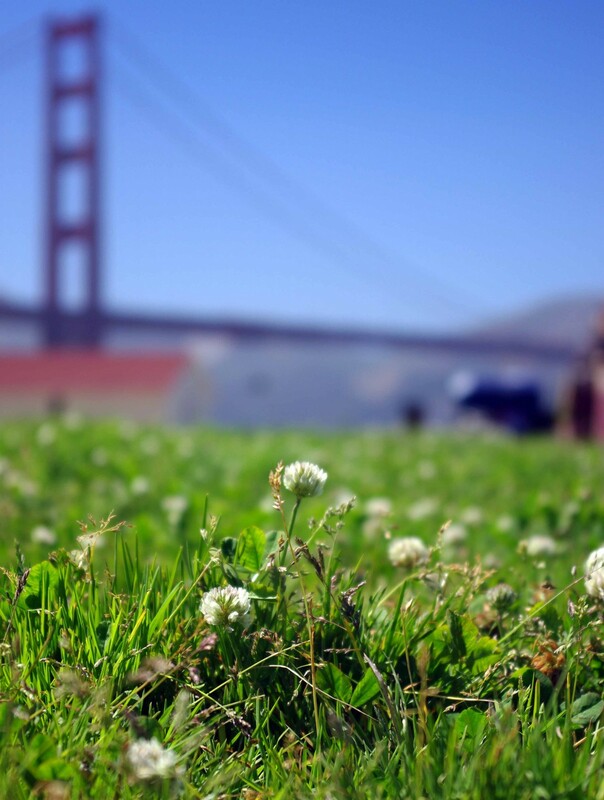 We now live in a neighborhood called Mission Dolores, right between the Mission and the Castro, and super convenient for practically everything in the city. I haven’t been as good about sharing pictures on social media, but I did upload a few to Flickr, so feel free to take a look. Now those of you who read here frequently know I was crazy-attached to my Tangerine. It took a lot longer than I previously thought to even consider another cat around here. But shortly after we moved, we were visiting a favorite winery, and they happened to have another litter of kittens (does that sound weird? It’s totally normal, I promise). We found an adorable tiny little blob of fur whose wee little eyes were practically begging us to take her home. But we didn’t. We were both traveling for work the next week, so the timing didn’t add up. We said goodbye, and crossed our fingers that she wouldn’t get eaten by a coyote (kidding, sort of), and the following weekend, we came back and got her. Life with a little kitten has been so much fun. But now she’s giant, it seems, because they always grow so dang fast. But this one – this little Sirah – she is something really special. I can’t believe I already love her so much, and she’s pretty attached to us, too. So, now we’re all caught up, right? Things have definitely changed, but really, a lot is still the same. And all of it – every last bit – couldn’t be better. Peel and devein shrimp, saving shells. Finely chop shrimp; set aside. Heat 1 Tbsp. oil in a medium saucepan over medium-high and cook smashed garlic, stirring, until golden, about 1 minute. Add reserved shells and cook, stirring, until bright pink, about 2 minutes. Add bay leaf and 2 cups water and bring to a boil. Reduce heat and simmer until stock is slightly reduced and flavorful, 8–10 minutes. Strain through a fine-mesh sieve into a large bowl; discard solids. Heat remaining 2 Tbsp. oil in a large skillet over medium-high. Add sliced garlic and cook, stirring, until fragrant, about 1 minute. Remove skillet from heat and carefully add tomatoes and 1 cup stock. Return to heat and cook, stirring occasionally, until sauce is beginning to thicken, about 3 minutes. Add nduja, using a wooden spoon to work it into the sauce. Reduce heat and simmer, stirring occasionally, until flavors have melded, about 3 minutes. Stir in reserved shrimp and cook, stirring occasionally, until opaque, about 2 minutes. Meanwhile, cook pasta in a large pot of boiling salted water, stirring occasionally, until very al dente (fresh-made pasta will only need about 2-4 minutes to cook). Drain pasta, reserving 1½ cups pasta cooking liquid.